Build-A-Bear Workshop has turned into Santa’s Workshop this month and the elves are busily getting all your gift requests ready for Christmas. By going to your local Build-A-Bear Workshop or to http://www.buildabear.com/ you can find an array of gift options for anyone on your list. For the first time in select stores, Build-A-Bear is offering “Gifts on the Go“, an array of customized furry friends that are stuffed, dressed and conveniently packaged in gift sets ranging in price from $15 to $40. Online shopping is easy and fun at http://www.buildabear.com/ with a whole new look. Shoppers can go through the Amazing Gift-O-Mate “Gift Generator” process that helps them identify the perfect gift based on the individual’s character traits. This season the elves are following the trends as well as keeping tradition in mind. Frosty the Snowman as well as Holly and Hal Moose are back along with new friends, Lil’ Robot Hal, Alvin of The Chipmunks, Winter Hugs Bear, Polar Bear, Lil’ Chocolate Cub Dressed as as boy Elf , and Brown Sugar Bear Dresssed as a Girl Elf. There are also numerous other ways to make your gift more personal for the sports fan, Star Wars fan, your little Princess, soldier, or even baby’s first Christmas. To see all the great gift options available go to your nearest Build-A-Bear Workshop or go to http://www.buildabear.com/. Holly and Hal will be in a one-hour animated television special that will premiere on ABC Family during Thanksgiving week, Tuesday, Nov. 24 at 7PM ET/PT (with an encore presentation Sunday, Nov. 28 at 10AM ET/PT). The Holly and Hal Moose: Our Uplifting Christmas Adventure will be released on DVD on Nov. 25. Build-A-Bear sent me the CUTEST Frosty the Snowman. Our daughter was so excited and has played and cuddled with him every day since we took him out of the box. 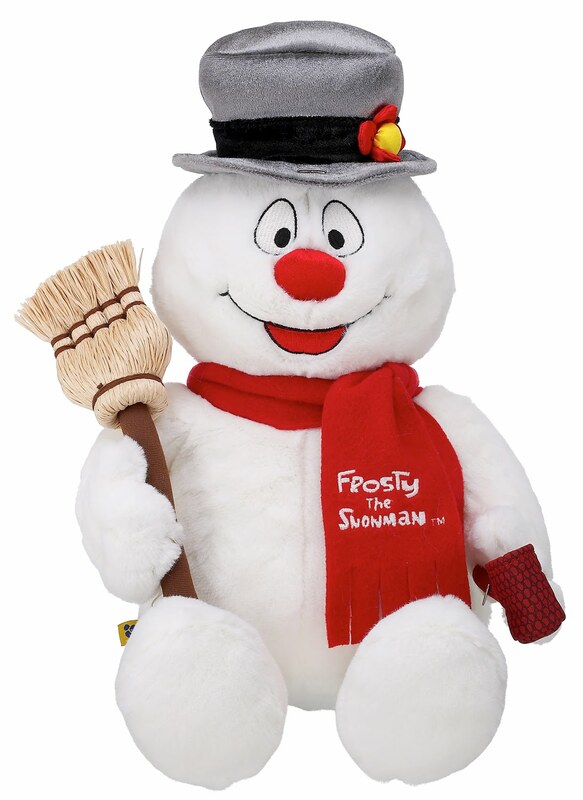 This cute and cuddly snowman comes with a removable broom and pipe. By tipping his hat, you can find some magic….he lights up and makes a sound! Frosty, as shown, retails for $30. Frosty is available for a limited time and only while supplies last. But, thanks to my friends at Build-A-Bear Workshop, I have another Frosty the Snowman to giveaway to one of you! To enter: Go to http://www.buildabear.com/ and look through their “friends” and then come back and leave me a comment telling me which “friend” is your favorite. Leave me an email address to contact you. This contest is open until 11:59 PM on Monday, December 7th. Random.org will choose the winner on Tuesday, December 8th. I will send it out right away, so you will be sure to have it in plenty of time to give for Christmas! Build-A-Bear sent me two Frosty the Snowmen, one for me to keep and one to giveaway to a lucky reader, a $60 value. Oh … I would love to win this … and then watch my girls fight over who gets to play and snuggle with it. HA! The first entry never wins though, does it? Sigh. How cute! It's a toss up between Frosty and Hal for my favorites! All of them are adorable though! We love all the build a bears, but Curly the teddy bear is my favorite. Would love to have a Frosty!!! Third time's a charm, right?!?! Emma doesn't have one of these yet! Oops, forgot to leave the name of the bear… I bet Kai would love Champ – A Champion Fur Kids! It looks very cuddly for a new baby!